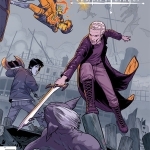 The Scooby Gang continue their battle against government forces, in hopes that the supernatural being will not be permanently eradicated from the world. 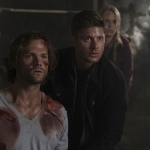 It’s a dangerous job, but it looks like they’re the best hope the supernatural world have in coming out of this alive. We start off with some undercover planning going on. Well, more like underwater. Spike and Willow have a plan to sneak in through the Sutro Baths, which is all well and good until they meet a cyborg octopus along the way. Because of course they do. It’s like the weirdness just follows this group wherever they go. Thankfully Willow is able to hit it with magic and get them free, which leads them to other adventures. 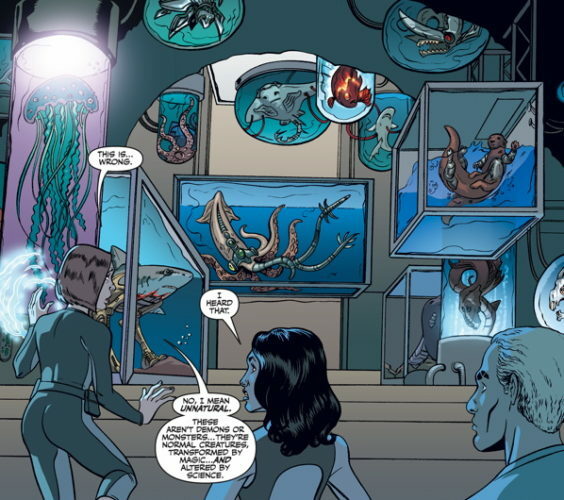 Once inside, they find a whole room filled with mutated, manipulated sea creatures. Seems like the government’s been up to some pretty bad things. They also find a workstation area that might hold further information, so Willow stays there to try to hack into the system with the others go searching for more clues. That’s when we find out that the messed-up sea creatures were only the tip of the iceberg. The group has to fight off a cyborg soldier and Spike rips out the soldier’s cybernetic eye, which frees him from the mind control. We learn of the atrocities that he’s been through. His name is Rudy and he begs for them to kill him, set him free from the pain and control. 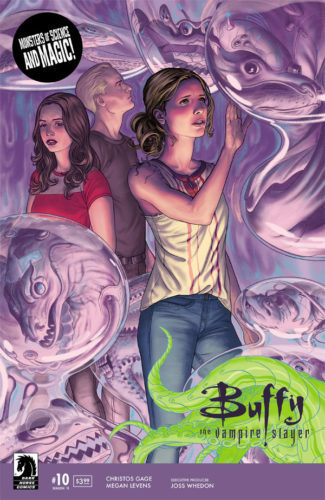 Killing bad things is Buffy’s job, but to take a human life, even as a mercy killing? She can’t do it, so it’s left to Spike to complete the act. Sad situation all around. They rejoin Willow, who says she has some answers, so they have to make their getaway in order to go over it in safety. Spike frees all the animals, creating quite a ruckus, and the gang returns to the Windsor Arms Hotel. According to the news, the supernatural attacks are rising. It only takes one spark for the whole thing to grow more dangerous, and that seems to be the way the world’s going if they don’t stop it. Trying to figure out who’s behind the whole thing, they discover that while the President is unaware, Press Secretary Joanna Wise and Secretary of the Supernatural Ophelia Reyes are definitely in on it. And so is the Vice President, who is their best bet in getting information. They decide that they’ll kidnap him and have him tell them everything he knows. Good plan. And to cover their tracks, they’re going to put a glamour on Xander so he looks like the VP and can temporarily replace him. This can only end well, right? The deed is done the next day, at the Hotel Luxe. The Vice President goes into his bedroom for some time alone and that’s when Willow and Xander show up. And Xander does his best to play the VP, even giving an interview, while the gang do their interrogation. Alas, they won’t be able to find out who is really behind it, since he has another spell on him preventing that knowledge from being revealed, but he does share that the first magic absorption ray is going to be sent up on a satellite tomorrow. That gives them a pretty tight timeline to work with, else the end of the world as they know it is going to be coming. They have to fight this, and win. There’s no other choice.